You bring down the thunder! Tropes about thunder, lightning, and other related things. Named for a lyric in "Bohemian Rhapsody" by Queen. Piss off a god, get a lightning bolt coming at you. Lightning that likes to move from one target to another. 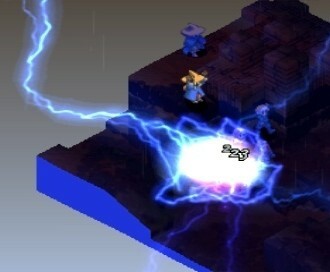 A sentient cloud can use lightning as a weapon. Lightning and thunder can really punch up a moment. Black Lightning, and his copycats, have electric powers. A jellyfish sting is either made to look like an electric shock, or actually is one. Love and romance represented by electric sparks. A tool in Cold-Blooded Torture. A common way to make a Deadly Bath. A phobia of the loud noise it makes. A common Elemental Powers trio. When 100,000 volts aren't even as bad as stubbing a toe. When 100,000 volts is lethal. Lightning is hard to control, unless you use this. It's not as cool if the light and sound delay means we can't see the flash and hear the boom all at once. Can make monsters, give superpowers, and bring back the dead. They make a lot of heat, and do a lot of damage, so why not pair them up? Two Death Glares at each other make mini lightning. Any device that shoots lightning. Using the "light" in "lightning" for showing things in the coolest way. When you can't use magic or advanced tech to attack with lightning, use these instead. It just looks cute to use that as an appendage. Somehow being able to generate electricity isn't cool enough, so fiction makes them spark and glow. Electricity can be chaotic without grounding, and the same applies to the sanity of those with electric powers. Using lightning or electricity as a teleportation medium. Using electricity as a powerful... annoyance tool. Stun guns can drop even the toughest targets. Stag beetles, fireflies and other creatures are associated with lightning for various reasons. Pairing drums and thunder, due to their booming noises. Lightning flashes on the 4th wall, to emphasize a moment. You won't get wet... but you will wish that happened instead. A favorite visual for one getting shocked. The two most common colors fiction uses for it.